Los Angeles residents Sonny and Gloria Kamm have collected teapots for over 35 years. Their interest in teapots began as an adjunct to their collection of contemporary art and led to a passion that has resulted in the world’s largest and most comprehensive teapot collection. The Kamm Teapot Collection numbers over 17,000 items and runs the gamut from historical decorative arts to industrial design icons to unique works of contemporary art. Sonny and Gloria Kamm are remarkable patrons of the arts. They have devoted considerable time and resources to the study, acquisition and care of art. They were early collectors of contemporary studio glass. Their support included a business partnership in the Kurland/Summers Gallery and founding members of the Art Alliance for Contemporary Glass. Gloria has been a leading docent at the Los Angeles County Museum of Art for over 30 years. During Sonny’s law career, he has advised many art collectors and served on several boards, such as the Craft and Folk Art Museum in Los Angeles and the Southern California Institute of Architecture. 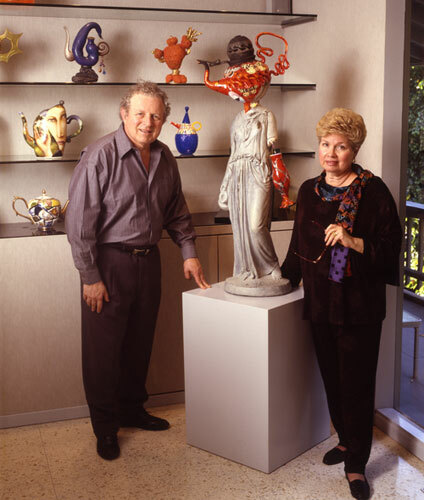 In 2004, Sonny and Gloria established the Kamm Teapot Foundation to administer their teapot collection. The Foundation is a charitable trust, with the Kamms as the primary trustees. Its purposes are to acquire, preserve, maintain and arrange for the exhibition of an extensive collection of teapots, tea sets and teapot-related ephemera. Headquartered in Encino, California, the Foundation operates a storage facility in Sparta, North Carolina where the collection is being organized and cataloged.